Homeowners are frequently counseled to 'get at least three bids' when they are considering hiring a contractor for home improvements. The goal, of course, is to get the best price for the work. But a competitive bid situation is not always the best route to take. When should you get multiple proposals, and when should you narrow your search to just one contractor? There really are only two general situations in which the competitive bid process will provide the homeowner with not only the best price, but also the best project. Very Small Projects: A tile floor in a powder room, a garden window installed over the kitchen sink; projects that can be scoped carefully and thoroughly with a brief site visit by the contractor are generally simple enough that several contractors can be consulted without the danger of anything being missed. Fully Designed Scope: If you already have a full set of dimensioned design drawings and a detailed Scope of Work, you probably cannot go wrong with competitive bids from various contractors. At this point, however, you have already invested a significant amount of money in an architect or designer to develop your dreams into detailed plans and specifications. As long as each contractor follows these, the bid packages should compare as apples to apples. Most home renovation projects, however, are the culmination of wants and wishes gathered over years of living in a house. Many are thumbnail sketches of a room addition here, a larger master bathroom there. Often the plans are only partially formed in the homeowners' minds, or you might have a Pinterest board full of ideas. In such circumstances the competitive bid process may actually result in a more expensive project in the long run, and one that is full of stress and errors. Enter the Design-Build Process. Many renovation contractors are builders who specialize in remodeling existing homes. A few, however, add a design component to their services that sets them apart from the others. Design-Build renovation contractors are able to make the all-important step of taking the homeowners' vision and applying it to the existing house structure and available expansion space on the property. Together the homeowners and the Designer-Builder translate desires into dimensions, and magazine photos into a detailed materials specification list. The overall project begins to crystallize on the design drawings, and the optimum utilization of house and property space is made possible by the input of a licensed residential builder during the earliest stages of design. In addition, an experienced renovation designer can assist in determining the 'look' that will best suit not only the layout of the house, but also the neighborhood - be it Craftsman, Victorian, or Transitional, to name a few examples. It is during the design phase that consideration is given to such things as plumbing fixtures, granite selection, tile patterns and styles, etc. As these items are discussed, priced, and selected the overall cost impact of the project begins to form, leaving little room for contingency or error later on. The homeowner has a complete picture of the finished product - inside and out - before a construction shovel breaks ground. Finally, the Design-Build Process not only puts all of the design parameters on paper at the earliest stages of the project, it also hands that information over seamlessly to the builder, a member of the same team that developed the design in the first place. The Design-Build Project may not result in the lowest possible price at the beginning, but it will invariably result in the highest possible economy, and the most efficient and successful project. In the end, this often proves to be the lowest real price as well. AJH Renovations, LLC offers a four-step Design-Build Process that our clients have found very helpful: Initial Site Visit, Conceptual Sketch and Ballpark Estimate, Detailed Design Phase, Contract Construction Phase. The design personnel of AJH Renovations, LLC will come to your home at the time most convenient for you to discuss the needs and wishes involved in your renovation project. The initial site visit often takes from one to two hours of talking, walking, looking at magazine photos that you have collected, and basically listening. This last item is the most important, because it tells us how you live life and what your priorities are for the planned renovation. To be best prepared for the initial site visit it is helpful to have a file or notebook in which you have collected the photos and ideas that you might like to see incorporated into the design. If you don't have dozens of photos ear-marked or clipped, that's okay; we will listen to your analysis of how your home needs to be improved, and ask questions regarding your preferences and style. Later we will pull this information together into recommendations for such things as tile, granite, cabinet layout, paint colors, and more. Another item to consider before the initial site meeting is your budget. As this is the design phase for your project, it is important to know the financial parameters as well as the physical ones. A 1,200 square foot master bathroom with its own fireplace is nice, no doubt, but it might be outside your budget, too! It is better all around to have a design that is within your budgetary constraints; remember, homeowners almost always make additional changes and purchases during the construction and finishing stages of a renovation - leave yourself some cushion to do this comfortably. AJH Renovations, LLC can help you prioritize design elements to best suit your finances as well as your dreams. After the initial site meeting, AJH Renovations will put together a preliminary concept drawing to show how your ideas best fit your space. This process may be as simple as a bathroom remodel or as complex as a multi-story addition. Depending on the complexity, we might develop a dimensioned 11" x 17" drawing for your review. If the project is large and complex, a second site meeting will probably be arranged, at which time our first recommendations can be discussed. We will bring transparent drawing paper with us to do overlays - allowing us to move walls, cabinets, and fixtures without having to go back to the drawing board. When the preliminary design has been roughed out, we will do a ballpark cost estimate for the entire construction stage. This estimate is usually within 15% of the detailed costs as long as there are no significant changes in the design. With the preliminary design and ballpark estimate in hand you have the items provided by AJH Renovations, LLC at no charge. Our 'free estimate' is far more than a number written on the back of a napkin; it is a visible description of your dreams for your home. If everything to this point is in order, we move on to the Detailed Design Phase. Along with the preliminary design and ballpark cost estimate, AJH Renovations, LLC will provide you with a Detailed Design Contract to review. This contract takes us on to the next and final stage of design. During the Detailed Design Phase we will measure the nooks and crannies, doors, windows, and other significant features of your house. We will generate a set of 24" x 36" dimensioned plan, elevation, details, and site drawings to fully develop the proposed design. 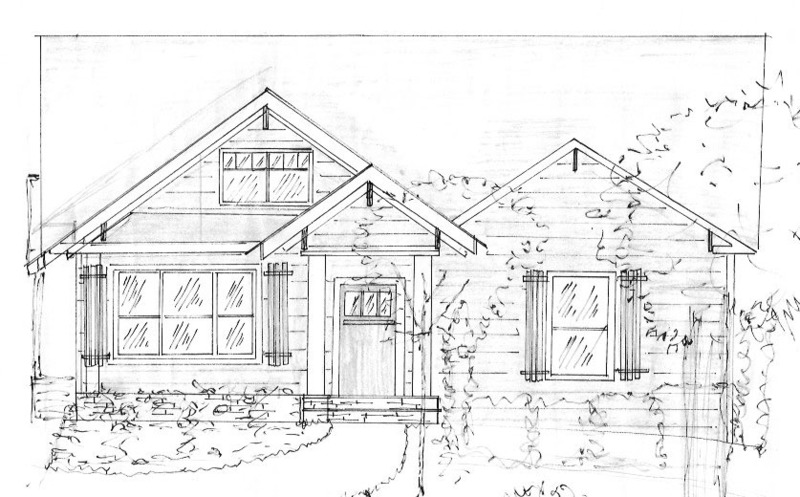 These drawings are suitable for bank financing, City or County permitting, and construction. As AJH Renovations, LLC is a Design/Build renovation contractor, we provide our design services as an extension of our construction department. Therefore we do not charge the design rates a homeowner will encounter with an architect or interior designer. AJH Renovations, LLC retains proprietary ownership of the design drawings. The homeowner receives as two copies of the design, and agrees not to furnish the design drawings to another renovation contractor. When the Detailed Design Phase is completed the homeowner has all that is needed to pursue project financing. At this time a fixed bid construction price will be provided along with an industry standard A-107 contract. Now it's time to break ground and begin the renovation!